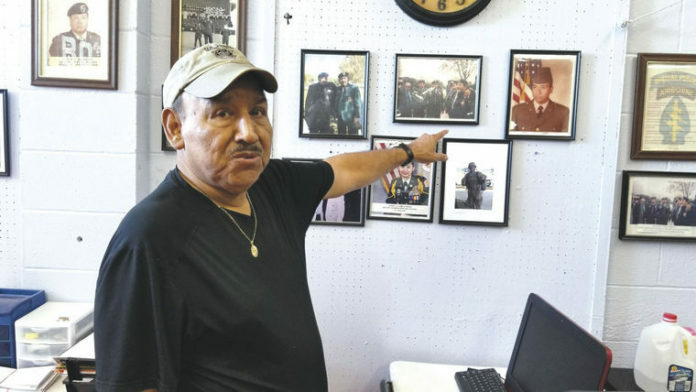 Juan Moya inside his boxing gym in Mercedes showing his military decorations and history as a Green Beret. MERCEDES — Juan Moya fought two tours in Vietnam with the Green Beret A-Team. Armed with an M-16 assault rifle and Gerber knife on classified reconnaissance patrol missions on the Ho Chi Minh Trail, Moya brought back information to stop the enemy from the North. Moya said he saw battles, he saw his fellow soldiers die, and he came across a tiger in a Vietnam jungle. Moya, 75, now is calling the community and Valley Veterans to participate with him in the Mercedes Veterans Day Parade he is organizing with the local American Legion. “We are still taking entries into the parade,” Moya said. “ROTC units, bands, floats and etcetera are welcome. “We are reaching out to everyone who wants to be in the parade and join the parade to contact us,” Moya said. When Moya found out the Veterans Day Parade had been canceled in Mercedes, he couldn’t look the other way. The Veterans Day Parade was started in the 1990s by the local Sons of the American Legion. According to parade organizers, the parade was not planned and that is when Moya decided to help organize the parade. He marched North up the Ho Chi Min Trail to defend freedom and country, and he hopes the community will patriotically march North with him and Valley Green Berets in Mercedes to celebrate Veterans Day. Moya has been planning the parade with J.A. Garcia, Post 172 American Legion Commander Robert Ruiz and Committee Member Alonzo Calvillo. The patriotic Veterans Parade will be held Nov. 11 at 5 p.m. beginning at the intersection of Texas Avenue and Sixth Street. Participants of the parade will proceed through Texas Avenue to the livestock show grounds. After the parade, a meal will be served inside the Youth Center of the livestock show grounds for veterans and their guests. Following the dinner, a social event will take place at the American Legion. Moya said the dinner is not only for Mercedes Veterans but all Veterans in the Rio Grande Valley who want to attend. Moya said up to 500 plates of food will be available for Veterans. “It’s for all Veterans, not just Vietnam vets,” Moya said. The Mercedes American Legion Post 172 has planned to host several Green Berets from the Valley who are expected to participate. “Let us unite together to recognize and praise all of our military veterans and theses amazing men and women who proudly and valiantly served our great country,” Moya said. For parade participation or more information, contact Commander Robert Ruiz at (956) 532-4992.